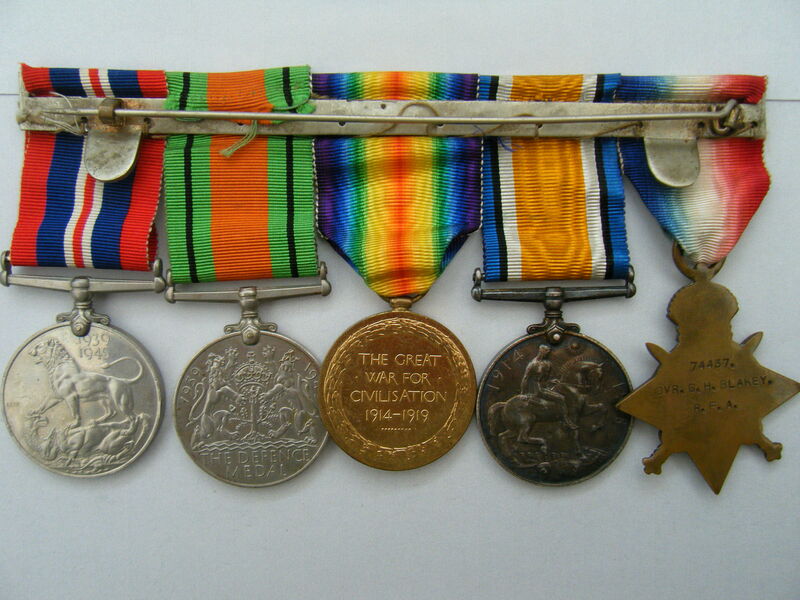 WW1 medal group awarded to 74437 Driver George Hubert Blakey, Royal Field Artillery. 1914-15 Star named to 74437. DVR. G. H. BLAKEY., R.F.A. 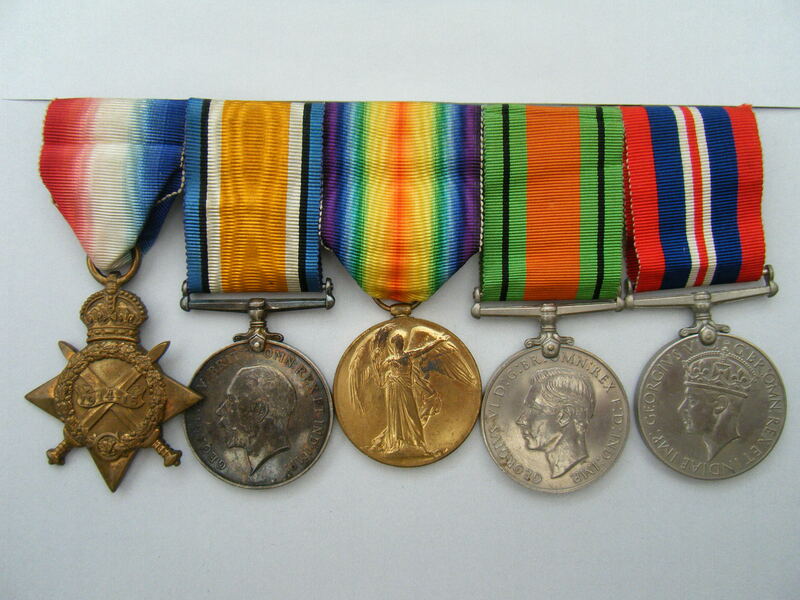 British War Medal and Victory Medal named to 74437. DVR. G. H. 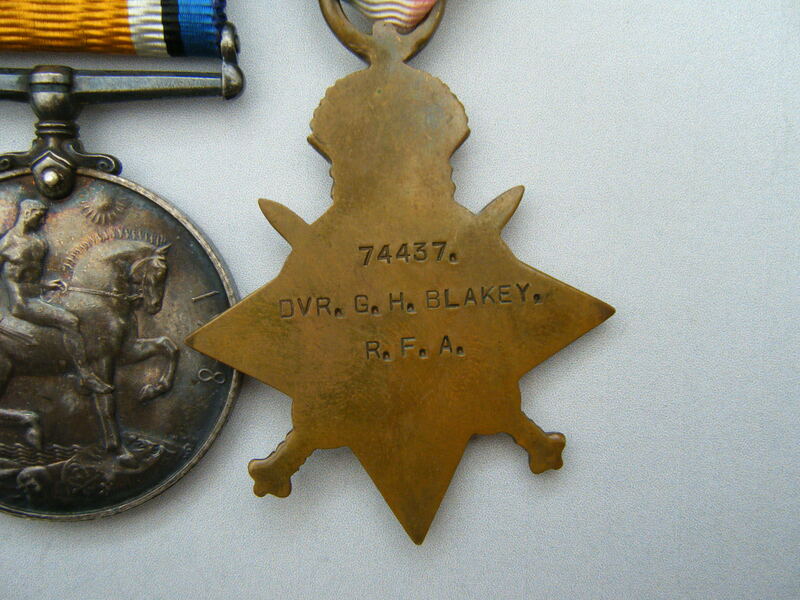 BLAKEY., R.A.
WW2 British War Medal and Defence Medal unnamed as issued. 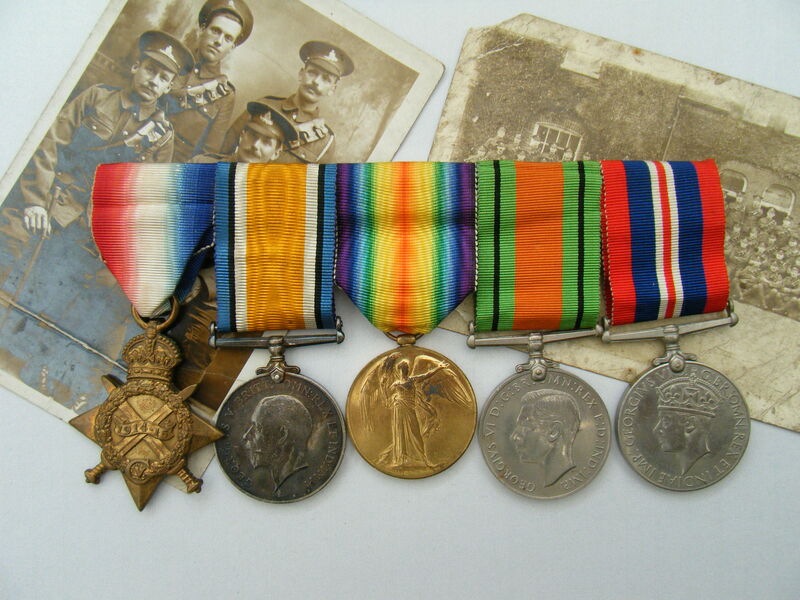 The medals are swing mounted (all with original ribbons) and this listing comes with a series of photographs of RFA personnel, one of which I assume is Blakey, although there is no indication on the photographs as to who is this man. Also includes is a printed copy of the Medal Index Card which can also be viewed by clicking on here (if you have access to Ancestry). Blakey’s service records can be viewed by clicking on here (if you have access to Ancestry). If you do not have access to ‘Ancestry’ a printed/electronic copy can be made available included in the price. Blakey of Prestwich Manchester, was born in 1893 and joined the RFA on the 4th January 1915 aged 20. He was initially posted to the 12th Reserve Battery before joining the 30th (Howitzer) Battery RFA and arrived in France on the 21st July 1917. The 30th (Howitzer) Battery was, as the name suggests, a howitzer battery of the Royal Field Artillery. It was equipped with the 4.5" howitzer, the Army's standard light howitzer. The battery was attached to the 3rd ‘Iron’ Infantry Division. The howitzer brigades comprised only howitzer batteries and, in a division, worked alongside (sometimes literally alongside) two brigades of field batteries, equipped with the 18-pdr gun. This organisation continued until mid-May 1916, when the howitzer brigades were broken up and their batteries incorporated into the field brigades. After this reorganisation, 30th Battery went into 39th Artillery Brigade but remained with the 3rd Division. Blakey’s first engagement with this unit would have been at the Battle of Loos (September - October) 1915, but the 3rd Division was involved in many of the main engagements undertaken throughout WW1. His unit history can be viewed by clicking on here and the 3rd Infantry Division’s history can be viewed by clicking on here. As a Driver, Blakey was a private soldier employed in driving and caring for the team of six horses which pulled his gun, or potentially in the battery's transport section, with similar duties. Blakey served with this unit throughout the war and was demobbed on the 23rd March 1919 and settled in Bridgemont, Strines, Cheshire. In 1939 Blakey would have been aged 46 and as this medal group comes complete with a WW2 British War Medal and Defence Medal it is assumed that he re-joined the services and undertook home based duties during WW2. PRICE £125 - please read the terms and conditions below. Please note that all listings which are sold will remain on the site for 14 days after the day of postage to allow access to the links that are contained within each of the separate listings - after this time, the listings will be removed from the site. Any documentation which is available on the net ‘free of charge’ will not be printed and included with your listing when it is posted to you. All pay to view documentation; such as ‘Ancestry’ held documents, will be provided as a part of the price paid for the listing (where specifically stated). Layaway facility to suite your budget is available, details on request. Why not part-exchange your un-wanted medals against your purchase? Postage, £5 Recorded Delivery for orders under £40, £14 Special Delivery for orders over £40, Overseas postage will be agreed with the buyer on a sale by sale basis. South Africa courier service £45.00. Returns accepted for items returned within 7 days of receipt only if medal/medals are not as described. Payment types accepted, £ Sterling or € Euros cash, Sterling Cheque, Sterling Bank Transfer, Paypal, (but only if your prepared to use the ‘send money to friends and family’ function). WANTED ALL items, all periods to the surname HAIGH or BROWNRIDGE. Any queries please contact by email or, by mobile: 07729 479618. © Red Badge I.T. Services Limited 2014. All rights reserved.